Entering the darkest two weeks of the year – when our days here in Copenhagen shrink to a mere seven hours and oftentimes seem much shorter – keeping the winter blues at bay can sometimes feel like a losing game. A friend who comes from the furthest reaches of northern Norway, where it stays dark from the end of November until the middle of January, reminds me that this time of the year is to be cherished: we get to light candles, bundle up in thick socks and sweaters, spend time with family and friends, and we get to bake cookies. So this year I am fighting the winter blues with a veritable cookie bonanza. Each day from today until Christmas, I will be making and sharing a favorite cookie recipe with you. Some will be familiar, but hopefully there will also be a few new cookies for you to try. So get in the kitchen and bake with me – and share your own holiday favorites in the comments below. There is always room for another cookie in all our lives! This first cookie is loosely based on another recipe by Gina DePalma, longtime Babbo pastry chef and allround inspiring dessert lady. 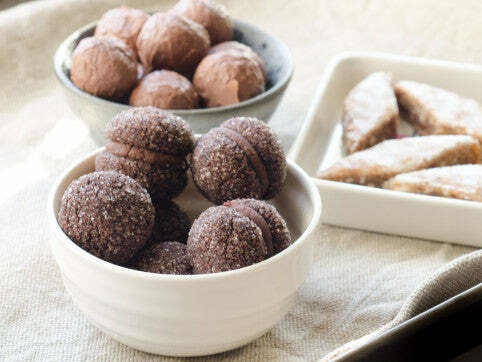 Baci di Dama, or Lady’s Kisses, can be found in pastry shops across Italy. A simple sandwich of tender cookies and creamy dark chocolate ganache, they make for the loveliest of holiday kisses. Gina DePalma’s recipe calls for almonds, but since hazelnuts are a big deal in the Italian region of Piemonte where they originate – and I have a massive amount stashed in my pantry from frequent trips to Italy – I like to make them with hazelnuts instead. The idea of sandwiching them with a boozy ganache of mulled red wine has nothing to do with Italy at all, rather with the ubiquity of gløgg in Denmark during the holiday season. Throughout the month of December a heady scent of spices can be found wafting in bars, at holiday markets and even at high-end hotels. It takes the cookies from year round delight and to boozy holiday treat. Adapted from Dolce Italiano by Gina DePalma. Place hazelnuts in a food processor and grind to a coarse meal. In a medium bowl, whisk together flour, cocoa, baking powder and ground hazelnuts. Set aside. In the bowl of a standing mixer fitted with the paddle attachment, beat the butter, confectioners sugar and salt on medium speed until creamy, about 2 minutes. Scrape down the sides of the bowl. On low speed, beat in the dry ingredients in two additions until the dough just comes together. Scrape the dough onto a sheet of plastic wrap, shape into a flat disc, wrap it up and chill for about an hour, until it is firm enough to handle. Line two baking sheets with parchment paper. Place the granulated sugar in a small bowl. Divide the dough into two pieces. Wrap and return one piece to the fridge. Roll the remaining half into a small log about 3/4 of an inch in diameter. Cut the log into 1/2 inch pieces and roll each piece into a ball, then roll the ball in granulated sugar to coat completely. Each ball should be about the size of a teaspoon. Place the balls on the prepared baking sheets, spaced at least an inch apart. Put the first baking sheet in the fridge to allow the balls to firm up and repeat with the remaining dough. Bake the cookies, one sheet at a time, until they are puffed and slightly cracked on top, approximately 9-11 minutes. Remove the cookies from the oven and allow to cool on the baking sheet for a few minutes before moving them to a wire rack to cool completely. While the cookies are cooling, make the ganache filling. Place the chocolate, honey, butter and salt in a medium bowl and set aside. Place red wine, spices, vanilla bean and orange peel in a small saucepan on medium heat and bring to a gentle simmer. Turn off the heat and set aside to steep for 10 minutes. Once the red wine has finished steeping, pour through a fine mesh sieve into another small saucepan, add cream and reheat to a gentle simmer. Pour the red wine mixtures over the chocolate and let stand for a minute or two, then whisk gently until smooth and glossy. Finally, whisk in the brandy. Allow the ganache to cool, whisking occasionally, until it is firm enough to pipe or spread. Once the cookies have cooled, pair them according to size and turn one cookie in each pair flat side up. Pipe or dollop about half a teaspoon of ganache on the bottom of a cookie, then take the other cookie and sandwich the two halves together. The ganache sets quickly, so it’s best to fill just a few cookies at a time. Stored in an airtight container at room temperature, the cookies will keep 3-4 days.